WECON Tribe consists of a group of passionate & motivated women (and men) who believe that together they can create circles of influence that nurture, support & inspire women entrepreneurs to achieve the highest levels of excellence. The tribe’s philosophy is “together we empower”, and your support can bring positive change to millions of lives. We welcome you to the tribe! Still wondering why WECON Tribe? Here are 7 reasons why you should absolutely apply today! Be a part of a help & support network : Managing a business takes commitment, focus, determination and a lot of patience! And when life gets too hectic, when coping with this new business role seems too hard, when things just don’t seem to get right, know that your tribe has got your back! Professional Growth & Accountability : “If you’re the smartest person in a room, you’re in the wrong room” Be a part of rigorous community and constantly improve yourself and your business model through workshops, masterclasses and mentoring sessions. Be surrounded by people with grit, hold yourself accountable! After all you can’t come to next meetup without making any progress, can you? 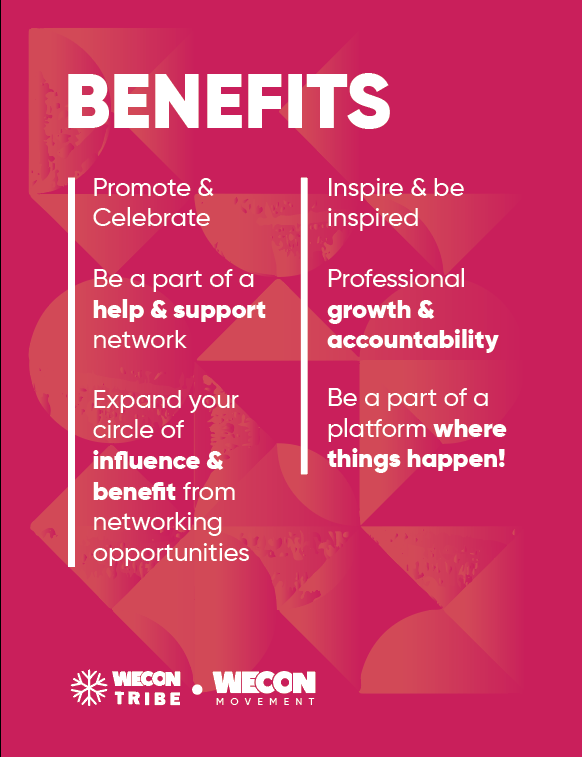 Expand your circle of influence & benefit from networking opportunities : This one goes without saying, networking is the number one unwritten rule of business and WECON Tribe is one platform where who’s who of women leaders, entrepreneurs and support organizations come together but wait! There’s still this one person missing and YOU know who! Promotion & Celebration : The tribe is you and you’re the tribe. Promote and celebrate every little achievement; Success is not the destination but the journey! Inspire & be inspired : Be a risk taker, not reckless. Regardless of how thoroughly or profoundly you plan, unexpected hurdles will come in to spice up your start-up story. Learn from experience and journeys of established entrepreneurs. Let them inspire you, teach you and instruct you! And if you have a story to share, know where the right listeners will be! Be a part of a platform where things happen! : Everything begins with an idea! Share your ideas, pitch in your innovative solutions, identify what you think can be integrated to tackle the prevailing issues and the tribe will help you make it happen! Special Discount and Offers : Avail a special discount on all WECON programs that, too, without any membership fee!